Almost everyone has HeadTrash! Let’s clean up the junk that causes stress and make room for healthy relationships with others. HeadTrash, much like regular trash, is something most everyone has, but not everyone knows how to handle if one person allows clutter to pile up, it affects everyone else. In an increasingly connected world, communication and relational skills can make or break careers (and relationships). 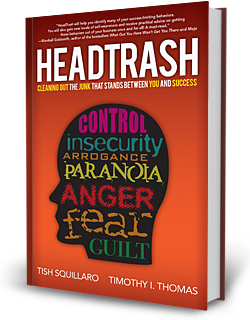 In their first book, HeadTrash, authors and consultants Tish Squillaro and Tim Thomas showed how individual anger, arrogance, control, fear, insecurity, guilt, and paranoia can wreak havoc and damage your creditability. Why do executives get stuck? Why do leaders sometimes find themselves pushing hard but not gaining traction? Frequently it’s because they’re working against themselves, defeating their best efforts with their own problematical thoughts and emotions. In this book, we refer to thought patterns and emotional tendencies that hinder your ability to respond to business issues in a productive and professional way as HeadTrash. Put another way, HeadTrash is the negative voice of your subconscious, engaging you in a deadly inner dialogue that only you hear, consciously or subconsciously, but which affects everything you say and do and everyone around you. 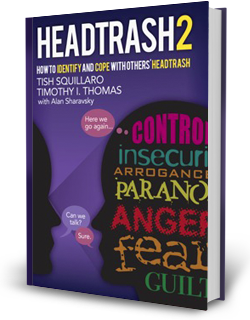 HeadTrash is any pattern of self-defeating feelings and thoughts that leads you into trouble and keeps you stuck there. Even worse, depending on your level of responsibility and authority, the rest of your team or company gets stuck, too.